WASHINGTON — Helmand valley, Afghanistan, has been pummeled, as of late, by U.S. air and artillery strikes targeting Taliban battlefield commanders and opium production facilities. The ramp up of operations in the sparsely populated region is a bit of déjà vu for U.S. forces. Not too long ago Helmand was the primary focus of the then-commander of U.S. forces in Afghanistan Gen. Stanley A. McChrystal, and the Obama administration’s troop surge. In the past several weeks, Helmand has once again taken the spotlight, this time as part of the Trump administration’s new South Asia strategy. Nine of 14 districts are controlled by the Taliban, according to a government watchdog group, and record opium production continues to fill Taliban coffers. The Afghan troop surge and rapid drawdown under the Obama administration has received its fair share of criticism, notably the decision to focus much of America’s combat power in one of the most sparsely populated regions of Afghanistan. Thousands of U.S. Marines had deployed to the poppy infested agricultural heartland, fighting a brutal counterinsurgency among small farming communities sprawling along the meandering Helmand River. Hundreds of U.S. and coalition forces gave their lives in the region, where cost of their sacrifice has only secured a handful of districts today. Taliban narcotics facilities in Helmand have renewed interest in the province. U.S. forces have deployed High Mobility Artillery Rocket System, or HIMARS, U.S.-B-52s, aircraft carrier based F/A-18 Super Hornets, and even an F-22 Raptor against drug labs, destroying millions in potential Taliban revenue. The decision to deploy a high-tech stealth jet to destroy a drug lab is a peculiar choice, though U.S. officials contend the platform was chosen because of its ability to employ the small diameter bomb, which can limit collateral damage and potential civilian casualties. U.S. forces have also renewed a focus on removing Taliban commanders on the battlefield. On Dec. 1, U.S. forces killed the commander of Taliban’s infamous elite Red Unit, Mullah Shah Wali, or Haji Nasir, in Helmand. And a small detachment of nearly 300 Marines in Task Force Southwest has also beefed up security in Helmand with HIMARS. Task Force Southwest has tasked with training and advising Afghan forces in Helmand. The unit has been there since late spring, the first deployment of Marines there since 2014. But, the focus on Helmand seems to be a strange choice by Gen. John Nicholson, the commander of U.S. forces in Afghanistan, whose strategy rests on Afghan government controlling 80 percent of the population. Much of the contested territory between Afghan and Taliban forces is in areas where opium is grown, Nicholson told reporters at a televised Pentagon press briefing in November. The strategy in Helmand also relies on Afghan forces being able to maintain some semblance of control in the province as they retake territory back from the Taliban. Efforts by the Marines appear to be paying some dividends. But whether the gains by Afghan forces hold will be a test of Nicholson’s strategy. The recapture of Nawa district near the provincial capital of Lashkar Gah over the summer by Afghan forces was a major test of Nicholson’s strategy, and potentially a blueprint for future operations. “After numerous airstrikes, maneuvers under fire and disabling of more than 100 improvised explosive devices, ANDSF [Afghan National Defense and Security Forces] forces retook the district center of Nawa from the Taliban in Helmand Province, July 17, 2017,” Maj. Kendra Motz, a spokeswoman for the Marine task force, said. The capture of the small district has provided breathing room to embattled Lashkar Gah, and has allowed nearby Boost airfield to restart air operations and help sustain the region with troops and supplies. It was the biggest success this year for Afghan forces in Helmand, Motz told Military Times. But more lies ahead for Afghan forces looking to expand a security bubble in Helmand, with a potential major looming operation to clear the bloody Sangin district. 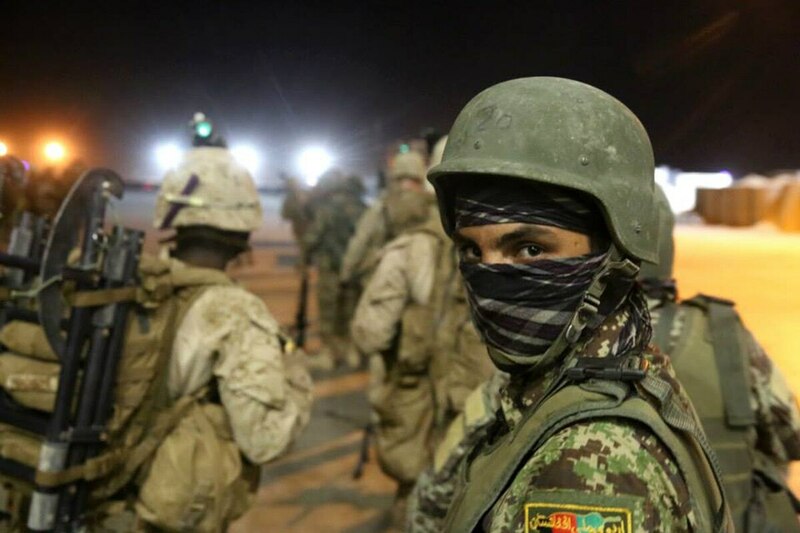 “Several ANA camps are located along the southern portion of the route before it crosses through the Sangin District center, which makes clearing Taliban fighters from the area a priority for both Afghan forces and local residents,” she said. A Marine unit in Afghanistan now has a powerful precision rocket artillery system with a range of nearly 300 km. Nicholson’s strategy in the province is not much different than the ‘09 troop surge ― its underpinning is precision strikes from American air and artillery power and the ability of Afghan forces to remain on the offensive. “The confluence of three efforts: Maiwand offensive operations, targeted operations by Afghan special operations kandaks and airstrikes in northern and southern Helmand have had profound effects in pressuring the Taliban in Helmand province,” said Brig. Gen. Roger Turner Jr., commanding general, Task Force Southwest. A new Marine task force will be headed to Afghanistan soon to relieve the current group of nearly 300 Marines. It will have big shoes to fill as many more areas will need to be cleared of Taliban militants, and as Nicholson continues to bolster America’s air war in the province.